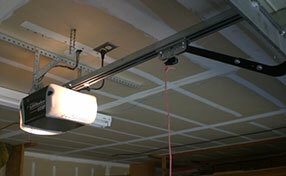 These are electric devices which enable the automatic opening and closing of garage doors. The overhead door openers are the most widely used. Each overhead device consists of a main unit, which houses the electric motor. This power unit is attached to a track. The trolley, which moves along the track, is connected to an arm, which is attached to the top of the garage door. The movement of the trolley enables the opening and closing of the door. It is pulled or driven along the track by a chain, screw or belt. These drives determine the main types of garage door openers. These include chain drive, screw drive and belt drive devices. All modern openers can be operated wirelessly. The power unit contains a receiver. The transmitter is a small battery-powered portable device, which is set to a specific frequency. When the transmitter sends signals to the receiver, the operation of the opener is initiated.